Christian Wolmar's cutting an intriguing figure these days. An acknowledged expert on transport issues (if you want to know why PFI was so bad for the tube, he's your man), he's spent the last couple of years campaigning to be Labour's candidate in the 2016 mayoral election. He's cycled the length and breadth of London in that time, meeting people and finding out their concerns. Whereas he was initially seen as a bit of an added extra to the hustings, he's proving quite popular with voters. However, he's got to get through the nomination election first, and he's up against five other seasoned political candidates. We couldn't let the summer go by without talking to him, so we met — appropriately — in a railway station pub to chew the fat. We thought we'd start in his area of expertise, and on the topic that was the big talking point of the last mayoral election: transport fares. Several Labour candidates say they'd freeze or even cut fares over the four year term, something Wolmar dismisses. "The notion that you can freeze fares for four years and not affect the investment programme is completely fanciful and unrealistic," he says. "I don’t want to make these promises — we don’t know what the settlement [the money that government gives to TfL] is going to be in two years time. We have no idea." These sorts of glib promises are one of the things that drove voters away from the mainstream in the last general election. Politicians promise the earth, and a cynical electorate folds its arms and says 'oh yeah?'. 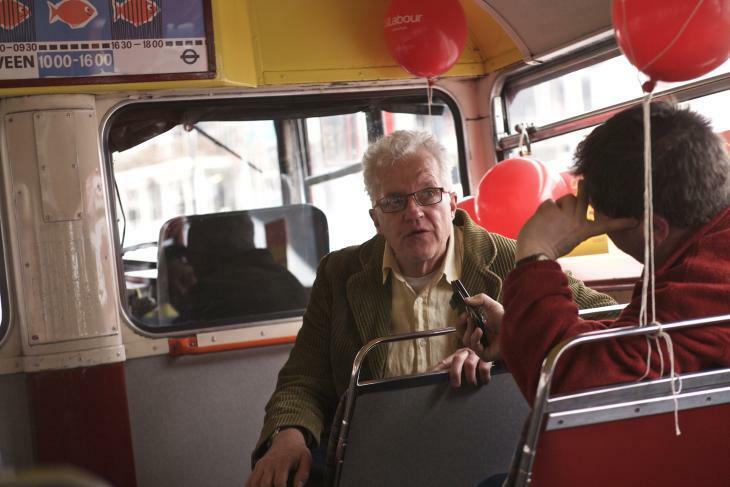 Wolmar agrees that pledging to cut fares willy nilly is "the wrong sort of politics. It’s the politics of making promises that you think are pandering to your audience but they don’t believe you. They’re not stupid. That’s what happened with the energy prices thing in the general election — that should have been a commitment to ensure that all the providers were on the same tariff so you’d be able to compare them. Instead we had a promise to freeze energy prices for a year and a half, which was meaningless because energy prices were going down. It’s about creating honest, coherent policies rather than making promises that don’t work when you start examining them." 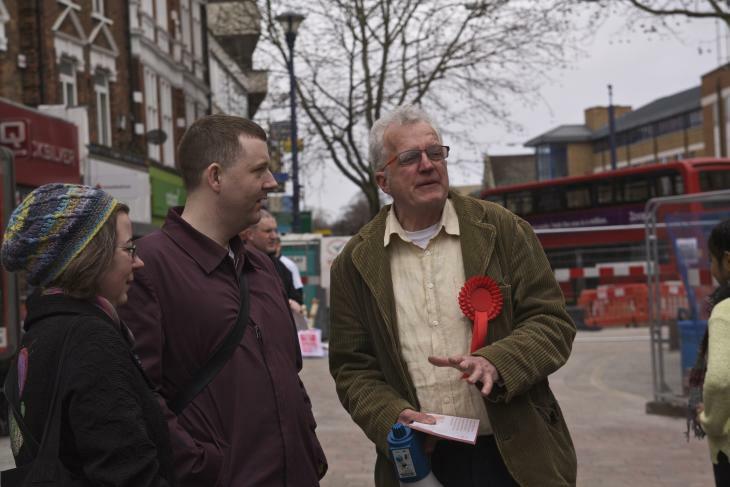 Christian Wolmar out campaigning in Lewisham. Even the Evening Standard — to which Wolmar used to be a regular contributor — has largely ignored him, preferring to concentrate on the rest of the field made up of current and former MPs. "The Standard will cover the conventional politicians much more because they’re all in this Westminster bubble, they don’t understand anything outside it. Of course I’ve had contact with the ES journalists, but — apart from Pippa Crerar, who’s been quite good — they just can’t understand what I’m trying to do. Why should it only be career politicians that are able to run London? Why not someone who has some expertise in a particular field, wants to do it, is a Londoner?" It's this sort of disdain for the usual political chicanery that's probably Christian Wolmar's greatest strength. At a recent hustings with all candidates he was the only one who didn't seem to be wrapped up in the post-election defeat naval-gazing that Labour is currently indulging in, instead wanting to get out there and be a candidate for all Londoners, no matter their political affiliation. He has a fresh — and refreshing — take on the mayoralty. "There is definitely an appetite out there for a candidate who isn’t a traditional politician," he says. "Labour needs to attract people concerned with environmental matters, they need to attract younger people. If you look at the team of people who support me, they’re mostly in their late 20s, early 30s, and they like what I’m saying, that sort of politics. Something different." If he's trying to do something different, it feels only natural to wonder why Wolmar isn't standing as an independent, to be apart from the whole pack. "I’ve always been a Labour person," he explains. "Part of my aim was to say to the Labour party, you ought to be more open to some of the ideas I’m putting out. Also, I think Labour is the party of progress. The NHS, the minimum wage, comprehensive education. All of those things were introduced by Labour governments. If, in this society of much greater inequality than ever before, we don’t believe in redistribution, the affluent paying fair taxes and that being redistributed to pay for hospitals and the police and the army and education, then what is Labour doing in politics? I come from that tradition." If he didn't get the Labour nomination, would he 'do a Ken Livingstone' and stand as an independent anyway? He shakes his head. "Absolutely not. I’ve never entertained that. There are a few people in the party who don’t like it but actually more and more people have appreciated what I’ve tried to do. They’ve seen that I might well widen interest, I might well widen the franchise." Widening the net of people who might vote Labour, or even the people who can vote to decide who Labour's mayoral candidate will be, is a large part of Wolmar's campaign. If you're a cyclist — as Wolmar is — you might see him out at junctions handing out cards, encouraging people to pay £3 online to sign up as a Labour 'supporter', which gets you a vote. This opening up of the decision process to pick a candidate (it used to be restricted to just full party members and affiliated unions) makes this particular election unique and rather unpredictable, and he's capitalising on it. "We’re flooding 60,000 of these leaflets across London, giving them out to people cycling in in the morning," he explains. "We want to do that with other groups but cyclists are the best identifiable group. And they’re already quite politicised and they like the message. If I managed to sign up 10,000 I probably would win." The message that's appealing to cyclists is Wolmar's conviction that car use has peaked. "Young people don’t buy a car, young people don’t think in that way in urban environments," he says. "They want public transport, they want to be able to cycle, they want to be able to walk safely. Boris seems to think we must have more of everything. So he wants cycle lanes but he also wants tunnels under London to bring cars in which is completely unrealistic. We have to manage demand of the most wasteful mode, which is individual people driving cars. Obviously I’m a big fan of putting a lot of money into cycling facilities, I think we can build on these first two proper cycle superhighways. The original ones weren’t proper cycle superhighways, but these two new ones will be game changing. And we boost other forms of public transport and walking." He also recognises the health issues created by poor air quality. He's against the Silvertown Tunnel scheme partly because of its environmental effects. He's pro more east London river crossings, but not for cars: "Don’t build a lousy cableway that doesn’t go anywhere to anywhere, build some proper cycle routes, pedestrian routes and more train routes, extend the DLR, create a whole lot of new links under or over the river." However, for all his expertise on transport, it's not the issue that Christian Wolmar believes is the most important. "Inequality is the number one issue in the election but that’s an overall policy issue. In terms of practical policy issues, housing is the number one issue. I’ve thought long and hard about why Boris has allowed through these terrible developments, rubber stamped luxury housing. And then he counts them as units that are built which is ludicrous. And I can only think it’s about social engineering. That he doesn’t believe poorer people should be able to live in the centre of town." He can see the impact of the housing crisis first hand, in his campaign team. "Boris says growth will continue at around 2,000 people a week coming into London but I think there’s a real constraint. All the people who work in my team, they keep getting shoved around, they live somewhere and then they get booted out and have to find somewhere else, they can’t set down roots. Some of them are getting to the age where maybe they’d want children and it’s really difficult. My designer, Dan, was at one point paying two thirds of his earnings in rent. Designers will never get paid huge amounts of money and we’re going to lose that talent. The London Chamber of Commerce recognises that, they said they’re worried about the security of London and they see it as the number one problem. And yet, particularly on the Conservative side, there’s a kind of cheerleading, saying let’s push house prices up as far as we can, this is great news for everyone. And it isn’t, it’s bad. We all pay for it. Every time you buy a drink you're paying sort of 50p towards the rent." What would he do as Mayor to help? "I refuse to play this numbers game," he says. "I’m not going to say I’ll build 20,000 or 30,000 or 40,000, because I’m going to build as many as possible of the right sort of houses. I won’t even count the luxury ones, it doesn’t count. I don’t agree that the problem is only one of supply, it’s one of what you supply." He wants to create a separate delivery agency that could assemble public land, give itself planning permission and either build social housing itself or bring in other organisations to deliver it. He acknowledges that the current model of letting developers argue their way out of building affordable housing isn't working. "I would employ some very expensive planners, just as TfL employs some very expensive people who are very clever (probably a few too many, actually). If they’re working for us, the taxpayer, we have to pay them a decent whack and make sure they can outdo the developers when it comes to viability calculations and all that stuff which they pull the wool over our eyes on." "I’d like to see 50% social housing in all developments," he continues. "My friends in housing say that’s very difficult to achieve but I think you can certainly set it as a target as Ken did. Ken didn’t get 50%, he got about 35%, but even so that’s a lot better than what Boris has done." For people who rent in the private sector, the message is a little more bleak — but realistic. "I think we’re limited with what we can do, you have to be honest about what the Mayor can and can’t do." He'd want to create a London-wide agency to give advice to renters and help good landlords let their homes, but any action on rent control or longer tenancies is unlikely with the current government. 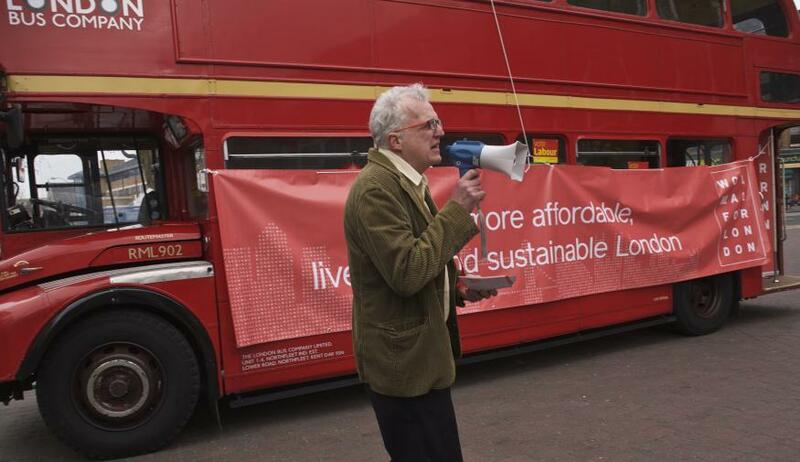 "The Tories are not going to want rent control," says Wolmar. "I’m absolutely for rent control. I don’t buy this argument that it will deter people from coming into the market. Some places might go out of the market but those houses will still exist, so they’ll help bring house prices down. I think a mayor who is saying these things openly would begin to make a difference but, much as I'd argue that London is a special case, the Tories will not bring in rent control." This probably isn't what most of us want to hear, but it's in keeping with his policy of not playing political games with Londoners. It's an interesting approach, and one we wish more politicians would take up. But this is rather the point, isn't it? He's not a politician. Whether that's a good or bad thing is up to you. If you want to have a say in who Labour's mayoral candidate will be — as well as who will be the next party leader and deputy leader — you have until 12 August to sign up as a Labour supporter. It costs £3 and can be done online. Read more about Christian Wolmar's policies on his website, and you can follow him on Twitter.